(center) appears with his wife (left) and Bill Ruane, Superintendent of St. Marys City SD (right). 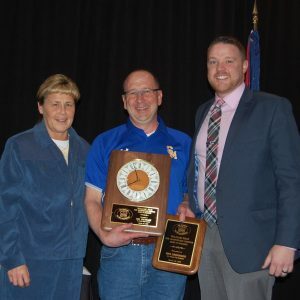 Dan Grothause, Safety & Transportation Supervisor for St. Marys City SD (Auglaize County) has been named Ohio’s 2019 winner of the William Rice Award of Excellence, making him Ohio’s Pupil Transportation Supervisor of the Year. Mr. Grothause is very well-respected in his region, specifically among the Auglaize County superintendents. He is known as a go-to person for area supervisors, bus mechanics, and anyone needing assistance. Dan is very knowledgeable, fair, and well-respected among his peers. Dan was honored with the St. Marys Police Department Citizen Appreciation Award in May 2016. He has been instrumental in the County assisting the ESC with annual quality bus driver inservice, Mock Bus Crash in 2003 and 2010, holds quarterly county-wide safety meetings, helps organize and lead bus driver inservice and SRT (Special Response Team) training all the county bus drivers. On a District level including his day to day transportation duties he is responsible for school safety, the submission of the districts safety plans, coordination of safety drills, leads monthly safety meetings that includes the EMA, local police department, representative from the county sheriff’s office, representative from the local medical center and school administration. The Ohio Preservice Team has put together two great advanced bus driver courses this summer! Join us at Apollo Career Center (6/11-6/12/19) or at Austintown Intermediate School (6/18-6/19/19)! Dr. Nancy Blackwelder will offer a special presentation at Apollo Career Center (6/10/19) and at Austintown Intermediate School (6/17/19). Registration for Dr. Blackwelder’s presentation, and for the Advanced Classes is handled through the Allen County ESC website. Download a flier about these events here. 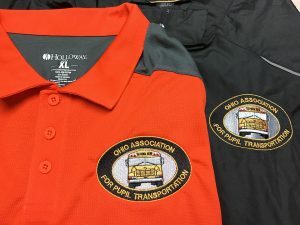 Members of OAPT can now order embroidered shirts and apparel with our organization logo! Log into myOAPT and look for the “OAPT Gear” menu item. Follow the instructions for our vendor and you’ll be showing your style in no time! This is a benefit exclusive to members. Not a member? Join now! OAPT LICENSE PLATE PROJECT: NOW AVAILABLE! OAPT is proud to announce that our school transportation license plate was approved, signed into law, and we have received a sample plate produced by the Ohio Bureau of Motor Vehicles. Visit the Ohio Bureau of Motor Vehicle’s website for details on purchasing this plate to support student safety programs in Ohio! OAPT is as strong as its membership, and we need you to continue our tradition of excellence! Memberships are due for renewal by July 1st — but we strongly encourage you to renew at the time of conference registration each year. As we transition to this online payment system, we are aware of a couple of instances were payment was made, but not properly recorded. If you believe you have already paid, but still received an invoice, please forward details on the payment including check number, or Paypal confirmation number to treasurer@oapt.org so we can ensure the issue is resolved quickly. If you attended our Annual Conference & Trade Show, but did not renew your dues, your membership will expire on July 1st. Current dues are required to receive the “Member Rate” on future conferences. We value your investment in OAPT, and look forward to working with you!